Summary: With its fine crumb and almost candylike pecan-studded shell, this is pound cake gone fancy. Preheat oven to 300°. Beat butter in a large bowl with a mixer until creamy. Slowly add powdered sugar, beating until mixture is light and fluffy. Beat in eggs, one at a time, beating well after each addition. Beat in vanilla. Gradually beat flour into creamed mixture. Heavily butter and flour a 10-in. (12-cup) plain or decorative tube pan (I sprayed it with Baker’s Joy); add almonds (or pecans), then tilt pan to coat inside with nuts. Scrape batter into pan and smooth top. Bake until a toothpick inserted in center comes out clean, about 1 1/2 hours. Let cool in pan on a rack 5 minutes (I recommend 10 minutes), then run a knife around edges of tube to loosen cake. Turn out onto rack and let cool at least 1 hour. Serve slightly warm or at room temperature, cut into thin slices. Make ahead: Up to 2 days, airtight at room temperature. Adapted from Sunset Magazine . Original recipe by a reader known only as G.L. from Bremerton, Washington, who gave it to them in 1963. They serve it frequently at staff parties. This month, for the inaugural edition of Bundt Bakers, our theme and ingredient of choice is NUTS. 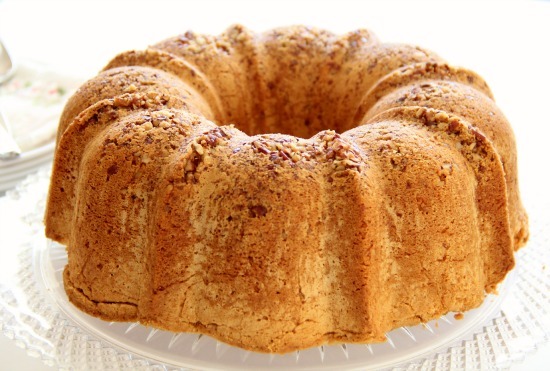 We have almonds and walnuts, pistachios and hazelnuts and lots of pecans, all baked into delicious Bundt cakes. It’s a wonderful array of nutty cakes for you today, hosted by Stacy of Food Lust People Love . Bundt Bakers is a group of Bundt-loving bakers who get together online once a month to bake Bundts with a common ingredient or theme. Follow our Pinterest board right here . If you are a food blogger and would like to join us, just send an email to Stacy at foodlustpeoplelove@gmail.com  or ask to join our private Facebook group . Disclosure: Heilala sent the vanilla for recipe development. Copyright © 2010 Shockinglydelicious. All rights reserved.